Buddha in a Traffic Jam is an upcoming Bollywood film conceptualized and produced by Friday Night Productions (a venture of ISB alumni) and co-produced by Phoenix Multidimensions and Vivek Agnihotri Creates. 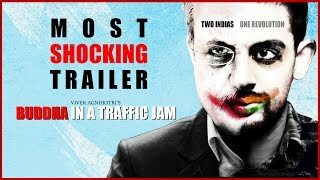 Buddha in a Traffic Jam is directed by Vivek Agnihotri and stars Arunoday Singh and Mahi Gill, while the other members of the cast include Anupam Kher,Pallavi Joshi and introducing Anchal Dwivedi. Buddha In A Traffic Jam premiered at the 2014 Mumbai International Film Festival in the India Gold category with a standing ovation and great reviews. The film was also bestowed awards and was the opening film in the 7th Global Film Festival besides participation in The Jaipur International Film Festival in February 2015. The critically acclaimed film is also an official entry in the 5th Dada Saheb Phalke Film Festival besides bagging three nominations in Madrid International Film Festival in the Best Foreign Language Film,Best Original Screenplay in a Foreign Language and Best Lead Actress in a Foreign Language Film to actress Mahi Gill.